Reds center fielder Billy Hamilton only played in 13 games with the big club after making his major-league debut in September last year, so you might not be very familiar with what kind of player he is. But Hamilton's a full-time starter this year, and last night he made a play that let us all know exactly what Billy Hamilton is all about. Did you see that? If you blinked, you may have missed Hamilton cruising into second for an easy double after slapping a soft liner into right field that reached Allen Craig's glove on two hops. Stretching a single into a double is one thing, but zipping from first to second base before the throw from right field even reaches the cut-off man is something else entirely. 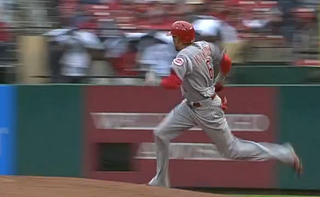 Hamilton's not showing off his speed so much as his ability to teleport all over the diamond. Baseball has seen plenty of speedsters before, but Hamilton is something else. His legend began to grow in the minors when he ran his way to an inside-the-park home run in 14 seconds, and this spring his home-to-first time was clocked at 3.3 seconds, the fastest ever. So get excited for Billy Hamilton. Baseball is a sport defined by regimentation—all circles and squares fitting neatly into their respective holes—so it's a thing to celebrate whenever a player with the ability to distort the game's hard edges comes along. Sometimes, a good blurring is exactly baseball needs.